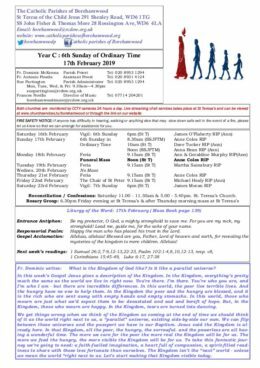 The weekly newsletter is published in glorious colour every Sunday and is available from both St Teresa and Sts John Fisher and Thomas More churches. You can also download it by clicking on the “Download” link on the right. The newsletter contains messages from Fathers Dominic and Antonio, the latest news and announcements, contact details, mass times and much more.